WASHINGTON (AP) — America’s top diplomat stepped back Friday from his offer of unconditional talks with North Korea, telling world powers the nuclear-armed nation must earn the right to negotiate with the United States. Secretary of State Rex Tillerson’s declaration before the U.N. Security Council marked a stunning reversal after he proposed discussions with Pyongyang without preconditions earlier this week. That overture was almost immediately rebutted by White House officials. So far, U.S.-led sanctions on North Korea and diplomatic isolation haven’t compelled Kim Jong Un’s government to stop its nuclear and missile tests, or to seek negotiations. “Well, we’re going to see what happens with North Korea. We have a lot of support. There are a lot of nations that agree with us — almost everybody,” Trump told reporters. He credited China — which accounts for about 90 percent of North Korea’s external trade — with helping on pressuring North Korea, while Russia was not. “We’d like to have Russia’s help — very important,” said Trump. He raised it in a Thursday phone call with Russian President Vladimir Putin. On the issue of starting talks with North Korea, Tillerson’s tone was significantly different from three days earlier. 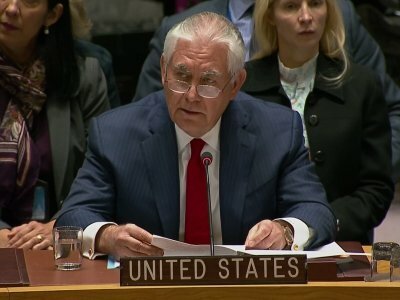 On Tuesday, Tillerson said at the Atlantic Council think tank in Washington that “we are ready to have the first meeting without preconditions.” He had also called it “unrealistic” to expect North Korea to enter talks ready to relinquish a weapons of mass destruction program it invested so much in developing, although that remained the ultimate goal. The White House quickly distanced itself from Tillerson’s remarks. On Wednesday, a National Security Council spokesperson said North Korea must not only first refrain from provocations but take “sincere and meaningful actions toward denuclearization” for talks to happen. The spokesperson, who was not authorized to be quoted by name and requested anonymity, said that given North Korea’s most recent missile test, now was not the time for talks. Tillerson and Trump have appeared to clash before on North Korea, amid questions about the former ExxonMobil executive’s future as top diplomat. In October, Trump said Tillerson was “wasting his time” trying to negotiate with the North. Trump’s tweet followed Tillerson’s talk about Washington maintaining back-channel communications with Pyongyang. “They know where the door is. They know where to walk through that door when they want to talk,” he told reporters. Tillerson called on China and Russia to go beyond U.N.-mandated economic sanctions imposed on North Korea over its nuclear and missile tests. He said North Korean laborers were toiling in “slave-like conditions” in Russia for wages used to fund nuclear weapons, while China was still allowing crude oil to flow into North Korean refineries. Russia’s U.N. ambassador, Vassily Nebenzia, said North Korean workers in Russia were guaranteed their rights, and he questioned U.S. commitment to a peaceful resolution of the crisis. China’s deputy U.N. ambassador, Wu Haitao, called for early resumption of dialogue, saying “the parties concerned should move towards each other” instead of directing blame.